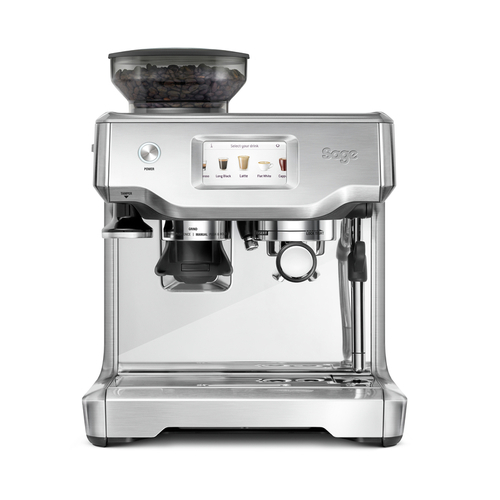 The perfect cup of coffee at a touch of a button - that’s what the Sage Barista Touch™ offers. The solution to a busy lifestyle and refined tastes, the £65 of Pact Coffee credit included will make sure every sip is barista quality. An intuitive touch screen lets you save 6 personalised coffees, or you can experiment - changing coffee strength, milk texture and temperature at the touch of a button. Just three, in fact: grind, brew and steam. With the built-in conical burr grinder and hands-free grinding cradle, making your morning cup easier (and tastier!) than it’s ever been before. With a 54mm portafilter giving you a 19 grams dose, you’ll get a consistent cup every time with the Sage Barista Touch™. And with a 3-second heat up time and low pressure pre-infusion, you’ll get a perfect extraction of all those delicious flavours. Fan of a flat white? The automatic steam wand will give you a quality micro-foam (essential for that latte art!) and is adjustable to your milk, temperature and texture preferences. Your machine will be delivered for free in 5 working days (or less). And when it comes to the coffee, what could be better than £65 worth of Pact to get you set up? We scour the world for hidden coffee gems and trade directly with farmers to give everyone a better deal. All Pact coffee - including our game-changing Espresso Blend - is sent out in letterbox-friendly packages within seven days of roasting, because that’s when coffee tastes best. To talk to one of our customer champions before you buy this machine call 020 3095 3975. Also available in black. Get in touch for more information. Enter your email address to receive the latest promotions, product releases and news from Pact. You can unsubscribe at any time!